Honda Makes One of the Safest Trucks on the Market! It hasn’t always been common for Central Illinois drivers to associate the engineers at Honda with the pickup segment, but the arrival of the 2017 Honda Ridgeline has forced many to reassess the whole market! The Ridgeline has the power, size, and towing capacity to keep up with any of its competitors, and in contrast with the rest of its segment, it also offers exceptional safety! In fact, the Ridgeline has recently been given top honors by both the National Highway Traffic Safety Administration (NHTSA) and the Insurance Institute for Highway Safety (IIHS). There’s no reason to settle for an unsafe option when you could find everything you’re after in the Ridgeline. No discussion of the 2017 Honda Ridgeline would be complete without mentioning the fact that it’s the first and only pickup truck that’s ever been designated a Top Safety Pick+ by the IIHS. * In order to earn this rating, the Ridgeline had to earn Good ratings in five crash tests, offer Advanced or Superior frontal crash protection, and earn an Acceptable or Good headlight rating. In addition to receiving the 2017 Top Safety Pick+ designation, the Ridgeline also earned a 5-Star Overall Rating from the NHTSA! ** The Ridgeline was awarded this honor because it received 5 stars in all of its frontal and side collision tests and 4 stars in rollover collisions. Drivers may be wondering what sets the Ridgeline apart, but the answer couldn’t be more straightforward. 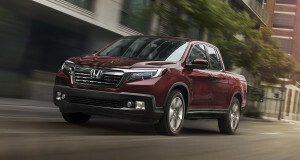 To quote Edmunds, “The Ridgeline offers driver aids not offered by the competition.” The reviewers at Edmunds.com are referencing the already well-known Honda Sensing safety package, which comes standard on the Ridgeline’s RTL-E and Black Edition trim levels. With this package, drivers will receive a Collision Mitigation Braking System, Road Departure Mitigation, Lane Keeping Assist, and Adaptive Cruise Control. It’s important to know that the Ridgeline’s exceptional array of technology features provides more than simple convenience. There are more than 300,000 vehicles with Honda Sensing on the road today, and these features save lives every day. Honda has always had a great reputation for safety, and Central Illinois Drivers really shouldn’t be surprised that they manufacture the safest pickup trucks on the market! Experience the Ridgeline for yourself by scheduling a test drive with us today! *The 2017 Ridgeline and Pilot with Honda Sensing™ and LED headlights, and the 2017 Accord Sedan with Honda Sensing™ and projector beam halogen headlights have been awarded the coveted 2017 TOP SAFETY PICK+ rating from the Insurance Institute for Highway Safety (IIHS) in recognition of their superior crash safety performance. 0 comment(s) so far on Honda Makes One of the Safest Trucks on the Market!